The August unemployment report released this morning by the U.S. Department of Labor looks like summer’s television season: repeat, repeat, repeat. 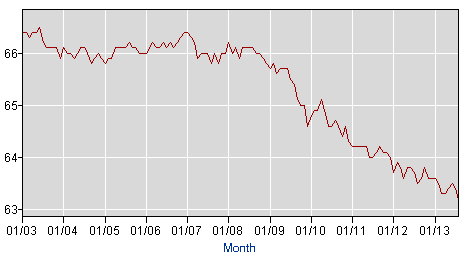 Job creation was an anemic 162,000. June and July job-creation figures were revised downward by a combined 74,000 jobs (for a total of 276,000 jobs over the two months, instead of 350,000). But in a glimmer of better news, the unemployment rate clicked down a decimal point, to 7.3 percent, which happens to be be the lowest rate since December 2008, when it was also 7.3 percent and zooming up. Florida’s unemployment rate is at 7.1 percent. Officially, 11.3 million Americans remain unemployed, but that figure includes neither discouraged workers who have stopped looking for work, or have run out their unemployment insurance, or part-time workers who can’t find full-time work, but need it. When those categories are included, the more accurate unemployment and under-employment rate stands at 13.7 percent. Nevertheless, that 13.7 percent rate is also the lowest rate since December 2008, when it was 13.6 percent, and it is considerably better than Florida’s 15.1 percent. The decline nationally was led by a reduction of 334,000 people among those working part-time involuntarily. Florida law is especially harsh against the unemployed, limiting their monthly checks to among the lowest benefits in the nation, and ending them sooner than last year. The civilian labor force participation rate edged down to 63.2 percent in August, from 63.4 percent the previous month, continuing a steep descent since 2008, when it stood above 66 percent. The fewer workers in the labor force, the less tax revenue flows into the national treasury, and the less economic output flows out of the economy as a whole. The August rate was the lowest level since 1978. It is in large part because more than 300,000 left the labor force that the unemployment rate fell–not because enough new jobs were created. The employment-population ratio, at 58.6 percent, also declined by a decimal point, and remains well below the 63 percent pre-recession level. In particular sectors, retail trade added 44,000 jobs (and 393,000 jobs over the past 12 months), with clothing stores leading the way. Health care added 33,000 jobs, with most of that in ambulatory care services. Professional and business services continued to add jobs (23,000). Within leisure and hospitality, employment in food services and bars continued to trend up (21,000), totaling 354,000 new jobs in the past year. 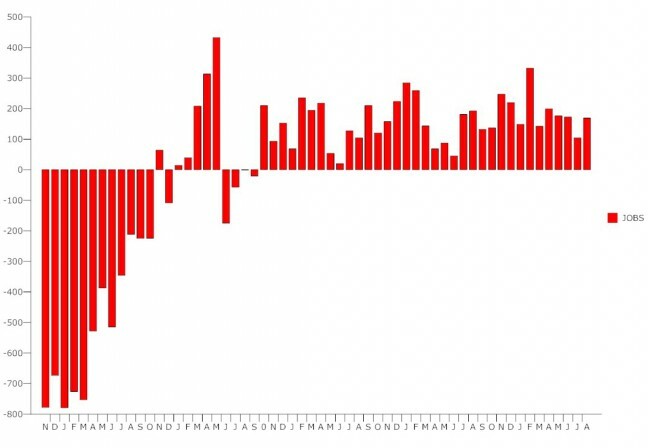 Wholesale trade added 8,000 jobs, and manufacturing, which had declined 10,000 jobs in July, added 19,000 jobs in August. The return of laid-off workers contributed to the increase in August. Over the past 12 months, auto manufacturers have added 34,000 jobs. And despite a good box-office summer, the motion picture and sound recording industry lost 22,000 jobs in August, following a gain of 8,000 in July. The average workweek for all employees on private payrolls increased by 0.1 hour in August to 34.5 hours. In manufacturing, the workweek increased by 0.1 hour to 40.8 hours, and overtime increased by 0.2 hour to 3.4 hours. The average workweek for production and nonsupervisory employees was unchanged at 33.6 hours. Average hourly earnings for all employees rose by 5 cents to $24.05. Over the year, average hourly earnings have risen by 52 cents, or 2.2 percent. There will be NO MORE full time jobs in America after Obamacare starts. Who in their right mind would want to have a business and be FORCED to buy health care for their employees who work full time ? Its much cheaper to hire only “part time” workers and you will not have to pay for their healthcare . Unfortunately, employment in this country has not improved very much at all. When we get some good news, it’s always followed with bad news. I know many people will quickly blame Obama for this and not think twice about it, but I will go a little further. I put the blame on many people and groups: Pres. Obama, our Congress and corporations. It seems corporations in today’s world are not interested in hiring. They want to maximize profits while providing horrible customer service. Some (not all) do not put enough emphasis on hiring here in this country. Customer service is so much better when we provide it. I am scared for where this country is heading for a number of reasons. These reasons are not directed at President Obama. I do believe he is trying to get this country on track. I do not believe he is an extremist Muslim or anything of that sort. I believe our “do nothing” Congress will not allow anything to get done and I feel that corporations, greed and lobbyists now run this country. It’s a scary thing for someone who’s only 30 years old to think about. God bless this country. Just think? the 1 % as you call them are the ones with jobs and soon it will be the unemployed 99% supported by the mere 1% of the tax payer….wake up, we are on the brink of total collapse….I travel this country every single day for my job and it is falling apart under our feet…….it’s too late we will never recover….im truly sorry, the truth always hurts…..
Time to celebrate and make obamma our King (after he completes his task of murdering a few thousand Syrians). These are limited jobs. PARTIME jobs & low pay jobs for the most. You’ve got to be stupid & naive to think that is good for the economy. Unfortunately gone are the days of investing in the USA by “hiring the American worker”. These are the days of horrible corporate greed and feeding the beast of the 1%. The trouble is, too many people are buying the old Reagonimics idea of “trickle down” economy. Folks, NOTHING is trickling down anymore. . . nomatter what you hear from the GOP or Fox! One thing for sure is that NO President can single handedly fix this terrible problem. We are now in a global work force situation that creates a clash of first and third world labor forces and economy. Our future generations need to compete by becoming the best educated college graduates on this planet. Future job searches may need to include other countries. We all need to start realizing that our world is dramatically shrinking, and act accordingly. The “game” is much bigger now, and it is not about to get any smaller for the convenience of the USA. You wanted change and you got it, with three more years to go, oops that is still a Bush problem. With all the unrest in this country and beyond, does anyone actually think that Pennsylvania Avenue or beyond cares anymore about the American people and how they might or not be faring in this economy presently? And when every door in Floriduh is slammed shut in ones face on a continual basis, what is the population to do? except what they have been doing which is “suffering” in a big way.